New study reveals world’s largest fish can live 130 years. Already the world’s largest shark species, male whale sharks can swim around the ocean for up to 130 years, according to a recently published study by scientists at Nova Southeastern University‘s (NSU) Guy Harvey Research Institute (GHRI) and collaborators from the Maldives Whale Shark Research Programme. Primarily funded by the Guy Harvey Ocean Foundation, NSU’s GHRI works on initiatives and studies to provide the necessary information to better understand, conserve, monitor and effectively manage shark populations. 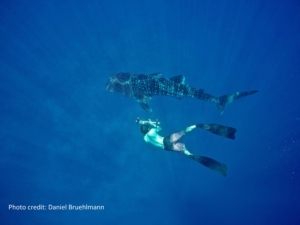 CUTLINE: Measuring length of the whale shark using laser photogrammetry.